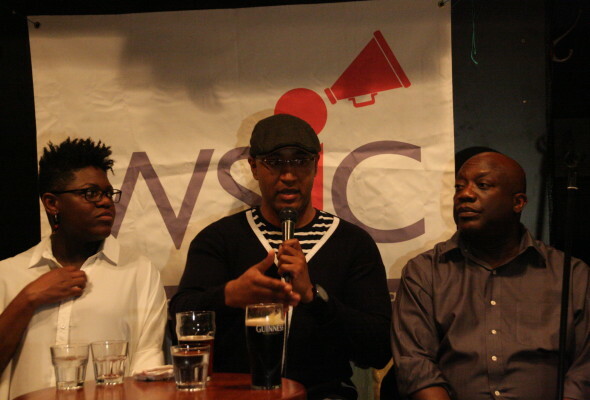 On March 9, Why Should I Care hosted an event about the Black Lives Matter movement to explore why it’s important to us in Toronto. We brought in an expert panel including activists Akio Maroon and Andray Domise and lawyer Gordon Cudjoe. Akio Maroon started off the panel. Earlier that day she had been given acknowledgment at Queen’s Park for her work on Bill 132, Sexual Violence and Harassment Action Plan Act. Akio gave a rousing speech, asserting that we should care about the Black Lives Matter movement as it is the only movement focused on all black lives. She stressed that this movement is not exclusive, rather, includes the voices of black women, “transgendered people, black educators,” black rappers, black lawyers, incarcerated black people, and “black rappers who wear their pants down to their ankles”. Andray Domise gave some political and historical context on racial tensions and black lives in Canada. Canadians are “masters of deception” when we tell ourselves that race relations here are “not as bad” as those in the United States. Historically, Canada glosses over its role in slavery. He points out that racial profiling still exists: ”we accept Syrian refugees, but turn away black poets,” he said, noting d’bi young’s recent blockage from re-entering the country. Carding happens here, and also black lives are largely absent from our cabinet, political leadership, and C-suites. Andray noted that Black Lives Matter isn’t about saying black lives matter more than anyone else’s – it’s a plea for parity. When the discussion part of the evening began, some very thought-provoking questions were asked. One new WSIC audience member asked about how to be a better ally. As a white woman, she knew a problem existed but how could she help? Akio said her first step was to become better educated in what the problems really are. Gordon pointed out that a great first step was even being in the room to understand the issue. As people who do not face systemic racism day in and day out, it is difficult to be an ally unless we understand what the problems are and use whatever privilege we are innately born with to eradicate the injustice. Colonization created structures of inequality in a system and within ourselves. Look at the ways in which you have learned to continue this violence. If you are born in a position of privilege, leverage it to help others. Then include the people who are saying “this is as issue for us” in the conversation about how to fix the problem. Andray added that we can check people in our lives when they make racist statements He said that black people don’t need you to talk to them about racism – have those conversations with your white friends to show them what’s actually happening. Stop making excuses for people and instead call them out an educate them. A mother in the crowd told us that her son has been carded 3 times that she is aware of. What can she do to protect him from the consequences of being known to police? What can she do to complain to make it stop? At this point, the conversation turned to lapel cameras. Neither Akio nor Andray thought lapel cameras on police officers would do much. In the US, they conveniently run out of batteries or are accidentally left behind in the cruiser at the most convenient of times. Both argued against going through the expense when there has been so little outcome. Gordon took a different approach. He was less fatalistic and thought the most important part of implementing such a thing would be to make sure it wasn’t the police who ultimately had control of the cameras and the information they collect. There are ways to deal with problems if we are willing to think outside the “what has already been done” box. Everyone recognized that the inequality in how black people, and aboriginal people, in Canada are treated is a problem that affects us all. It will take more than just activists to deal with these problems. Everyone has to understand that this is an issue that we all have a role to play in. WSIC would like to thank our three speakers for an incredibly engaging and thought-provoking discussion.